It keeps snowing here in that New Hampshire in February way of things. We expect Winter Storm Hugh to bring us gifts beginning tomorrow night after sweeping across so much of the country. Despite all the snow, we begin to prepare for spring. The brighter light has brought on lots of blossoms in the greenhouse. 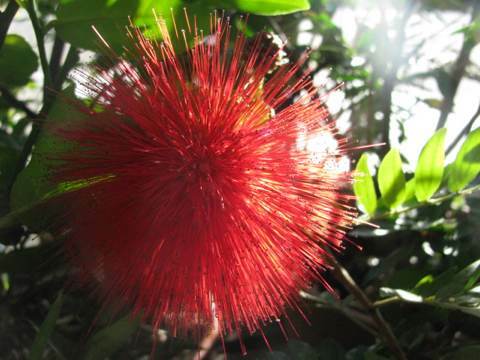 Here, Calliandra explodes in radiant red balls while the Sweet Olive and Citrus blossoms waft their fragrance into the warm humid air. My arm is much better. I have been delighted to find that I am able to knit once again something that took me at least a year to be able to comfortably do after the first arm break. 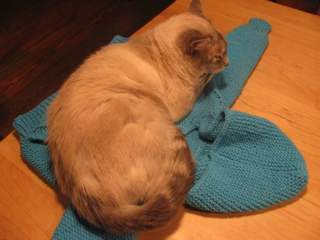 Elder stateswoman cat Mishka checked out the hoodie I just knit for Grace and said it would do. I am so happy to have knitting needles in my hands again and to have the seeds ready to start in the greenhouse in a week or so! I hope spring is showing its encouraging face in your world too!